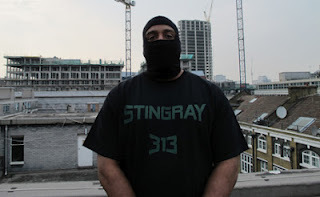 There is a very frank audio interview with DJ Stingray in which he mentions working with both James Stinson and Gerald Donald. He was speaking with Red Bull Music Academy (Gerald Donald has already done an audio interview with them) and we learn amongst other things that James Stinson slowed down his track, ‘Telepathic Seduction’, for release as Mystic Tribe A.I. on the B-side of The Other People Place 12” and that he was working on Urban Tribe material with Gerald Donald which eventually came out as the recent NRSB 11 12” on WeMe. He also talks about becoming the Drexciyan DJ and balaclavas versus ski-masks. It’s worth a listen to the whole program if you have the time. Here is a bunch of live videos below that I know of from Dopplereffekt’s US tour. There are a few newish or at least yet to be released tracks in there. I did get one report from the US tour of a bad experience they had in San Francisco which I think is worth including here if it can stop it happening again. This is the first new material from Heinrich Mueller under his Der Zyklus guise since the Cherenkov-Radiation 12” way back in 2008. These new tracks are cut from quite a different template however but will not be unfamiliar to anyone who has been listening to his work in the last few years. There are two new full length tracks here and one untitled short piece as well. Both take their names from isotopes, 'Krypton 84' and 'Thorium 232'. Isotopes are not stable and are constantly decaying, so much so that they are referred to as having half-lives. Perhaps Mueller sees these tracks as short soundtracks or laments to these active but still decaying and unpredictable isotopes? 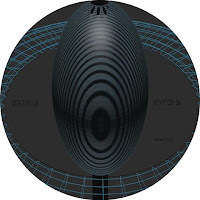 For me 'Krypton 84' brings images of orbit to mind as it weaves various sounds and tempos into ever changing patterns. Certain arresting new sounds continue to appear throughout and it keeps your attention because of this. 'Thorium 232' is far more sinister and nightmarish in its slow paced and reverb drenched grandeur. Musically it also reminds me of the darker Zwischenwelt tracks. There is a short untitled track next that I actually liked very much and would have enjoyed more if it had developed longer, all textures and atmosphere. All the tracks are vocal-less and are all the more disembodied and utterly alien for it. I don’t think anyone else could be making such unfamiliar sounding music as this. Interestingly this does not appear to be available anywhere as an official download. This could be interpreted as significant as we are dealing with music that does need a certain amount of patience and good quality audio reproduction to fully appreciate it. The only way to get this artifact is by spending an amount of money (far more than for a download), waiting for it to arrive, going through the experience of handling the vinyl, placing it on a turntable and listening to it on a presumably decent sound system. This latter ritual aspect is important with this type of music too I think. Thankfully there remain labels such as WeMe, No Comment etc who are willing to work with Mueller in this way. In theory these artifacts do become rare, collectable and hold their value at the very least which does compensate somewhat for the difficulties in obtaining them. This is available now on mint coloured vinyl from this link You can listen to 'Krypton 84' here. I was very kindly sent a test pressing for review along with turned out to be a great new album from CN, RA. You can it check it out at their BandCamp link and follow the link there for the limited blue vinyl 12” only on WeMe.